alaTest ha recogido y analizado 7 comentarios relacionados al producto 1More Dual Driver In-Ear. En promedio, la calificación para este producto es 4.3/5, al ser comparado con la calificación 4.0/5 de otros productos en la categoria Auriculares. La gente está encantada con el sonido. La calidad del montaje también consigue un buen feedback. El tamaño consigue revisiones negativos. Analizamos las valoraciones de los usuarios y los expertos, la edad del producto y demás factores. Comparado con otros Auriculares el 1More Dual Driver In-Ear recibe una alaScore™ global de 91/100 = calidad excelente. 1More's Quad Driver in-ears will satisfy bass lovers and thrifty audiophiles alike. The Quad Driver In-Ear Headphones sound fantastic and are worth their price, though 1More offers a compellingly affordable alternative. Excellent, accurate audio performance with wonderful balance between lows and highs. Comfortable, secure in-ear fit. Nice array of included accessories, including loads of ear tips. Expensive. Not for lovers of massive bass response. 1More dual driver earphones review: Where the 1More really stands out is with its emphasis on audio quality. 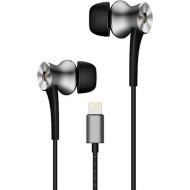 We spend some time focusing on 1MORE's Dual Driver In-Ear Headphones. We can say straight out that these are incredibly good for the price. 1MORE C10002 sono un paio di auricolari in-ear in grado di offrire un'ottima indossabilità e una buona qualità d'ascolto.